The "concept as plot" approach to storytelling works well enough if the story being told is kept short and simple. Because a concept, no matter how complex and compelling, isn't a plot. Yet some ideas are so neat that you can fool an audience into treating them as if they were. To a point. As Abraham Lincoln famously said, "You cannot fool all the people all the time." That pretty much describes the arc of M. Night Shyamalan's career. He made getting fooled a heap of good spooky fun The Sixth Sense. But it went to his head and his movies got increasingly repetitive and self-important. Then the feeling was, "Fool me twice, shame on me." The Matrix elevated "high-concept" to a half-billion dollar franchise by letting the audience in on the secret at the start. We do love a shared secret. But after dipping into the same conceptual well three times in a row, the water started to taste brackish. Patema Inverted sets forth with one neat idea, and it's good for a hundred minutes of screen time (and not much more). There are enough loose ends at the end to justify a sequel, but a sequel would demand an actual plot. A concept is a told joke. We got it already. Patema is the heroine, and the "inverted" (sakasama) means exactly that. In this quasi-dystopian future, there is an "above ground" tribe and a "below ground" tribe. Gravity works the opposite for each tribe. The story about how this happened is covered in the first thirty seconds and then forgotten (until the end), which is a smart way to do it. When you're building on "concept" alone, don't belabor it. The more people think about it, the more holes they'll find. There are enough holes in Patema Inverted to make a sieve (to start with, how the economy actually works), but out of sight, out of mind. Otherwise, the one (annoying) flaw in the movie is that the "above ground" world is one of those by-the-numbers Orwellian societies ruled by one of those by-the-numbers cartoon villains, spouting off in religious terms without a religious context anywhere in sight. As a general rule, if you have to toss a dramatic foil into the mix in order to create actual conflict, there isn't any actual conflict. But if you do, make sure it's Hugo Weaving. The backstory, brief as it is, suggests a better approach. The "dictator" should have been the last descendant of the scientists who caused the problem in the first place, desperate to hide the enormity of their error. Yes, scientists make mistakes and they have egos too. Thus his interest in Patema's tribe: still trying to figure out what went wrong without revealing to anybody what they did wrong. 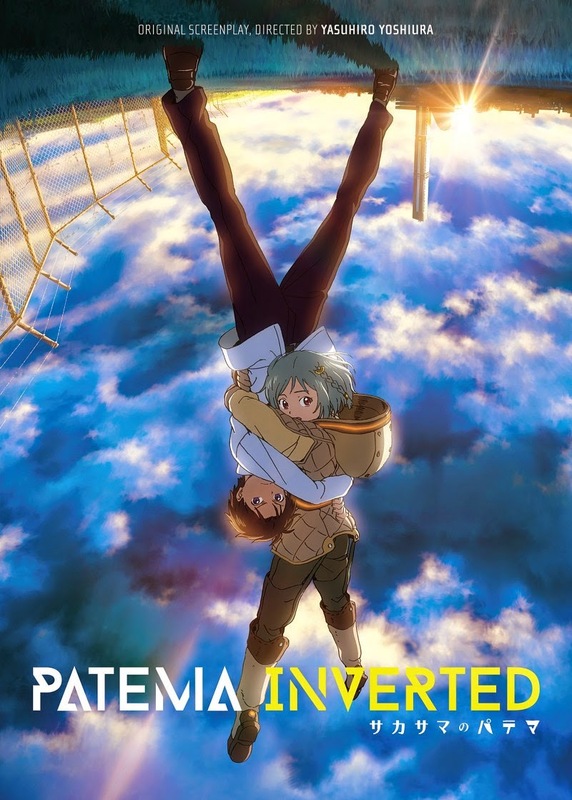 That aside, Patema Inverted is a fast-paced, fairly family-friendly (though not for acrophobes) exploration of a surprisingly deep philosophical idea. Director and writer Yasuhiro Yoshiura's clever use of perspective literally asks: "Which way is really up?" In this case, as in so many, the answer all depends on where you happen to be standing. Wasn't there a recent movie with just about the same concept? Don't remember the name because it was so stupid, I stopped watching after ten minutes.